Day 0: Party of the Century! Join us at St. Mary’s Hospital from noon to 4 p.m. to mark 100 years of care … and counting! Day 1: Happy 100th Birthday, St. Mary’s! Exactly 100 years ago today, St. Mary’s Hospital opened its doors to care for patients and the community. Though symbolized by bricks and mortar, the hospital is more about people who care. 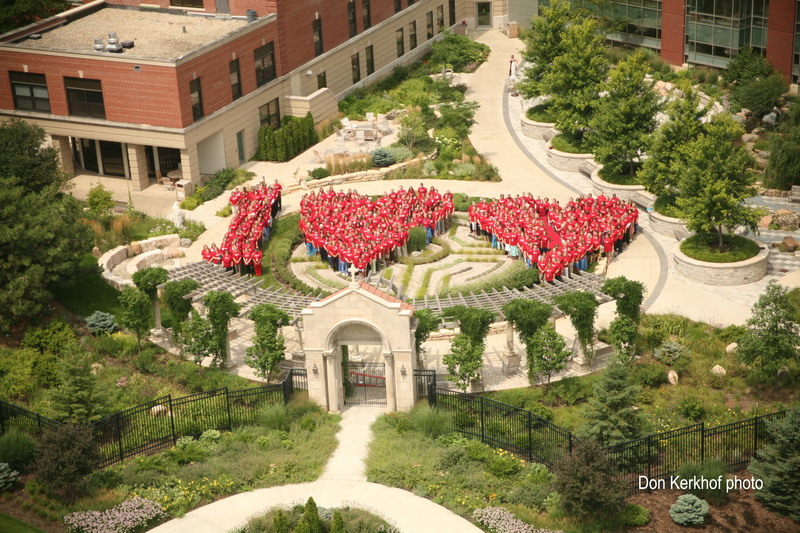 Take a look at one way that our 2012 staff commemorated this historic centennial year, and don’t forget to join us at the hospital for the birthday party tomorrow (Sunday, Sept. 23, 2012) from noon to 4 p.m.
Watch the excitement of the day! It started as a hospital orderly and unfolded into four generations of the Meicher family working at St. Mary’s and three generations (so far) finding their spouses at the hospital. In his late teens, Charles Meicher came to Madison from his farm home in Pine Bluff and found work as a hospital aide at St. Mary’s, a new small Catholic hospital on the edge of the city. At the same time, Margaret Renz was employed in the kitchen of St. Mary’s. When her father became ill and was hospitalized, she became friends with the young aid. After he served in World War I, Charles and Margaret were married in 1921. His Army training as a mechanic led him to operate the South Park Street Garage with his brother. The family settled into a house on Delaplaine Court, where they raised their family of four sons and one daughter. In the early 1930s, the four brothers served Mass for Father Leo in St. Mary’s Chapel. One of the boys, Joseph Meicher, worked in the office at St. Mary’s before serving in World War II. He returned to St. Mary’s to help pay his expenses at the University of Wisconsin. And that’s when he met a young nursing student from LaCrosse, Frances Murphy. Frances graduated from the St. Mary’s School of Nursing in 1946 and married Joe in 1947. Frances worked as a nurse at St. Mary’s until her six children were born – all at St. Mary’s. Joe and Frances lived on High Street, just steps away from Joe’s parents’ home on Delaplaine Court. When the children were in school, Frances returned to nursing. Just as their father and uncles had done, the Meicher boys served Mass at St. Mary’s Chapel, and, just as their parents and grandparents had done, all members of this Meicher clan worked at St. Mary’s during their school years: Jane in the business office; Julie in Dietary; Jody in Dietary and later as a unit clerk; Jerry in volunteer services; John in Dietary and in the business office; and Jim in Dietary and later in the Emergency Room. In 1978, Jim took a position with Plant Services, where he remains today, and younger brother John was hired as an accounting analyst in 1987. Today, John is director of Finance. Jim has kept the family tradition of meeting his spouse at St. Mary’s. He met and married Chris Krajewski, an LPN at the time. And though brother John didn’t meet his wife at St. Mary’s, he is not far off track. John met Lori Scheibe at college, and she now works as a health assistant in St. Mary’s Employee Health Department. Two of John’s and Lori’s children became the fourth generation of Meichers to work at St. Mary’s. Their son, Joseph, helped in Food & Nutrition Services while attending school, and son David currently works part-time in the hospital pharmacy. It’s difficult to write about Peggy Weber’s impact on patients, survivors and their families without drawing on symbolism and cliché. But it’s just so easy—and honestly, so fitting—to describe her as “an angel from heaven,” “a pillar of faith,” “the Mother Theresa of Madison,” or, in the kind words of someone whom Peggy has supported through several family tragedies, “the pot of gold at the end of everyone’s rainbow.” When life is a struggle, or when the worst happens and it’s time to say goodbye to our loved ones, cliché is comforting—and it’s a simple, beautiful way to articulate Weber’s deeply genuine commitment to everyone she cares for. And if a record twenty-three nominations for “Madison’s Favorite Nurse” doesn’t reflect the depth and breadth of her work, a walk through St. Mary’s Hospital, where Weber was educated and where she has spent most of her forty-one-year career, or a visit to Sunday Mass at St. Patrick’s in Cottage Grove certainly does. For Peggy, that trust she builds with people extends beyond the walls of hospital and church—and for as long as God intends. For all of this strength, knowledge, warmth and compassion, Peggy very humbly credits the Sisters of St. Mary, thirty years of experience in the field of psychiatry and two very special nurse mentors, Carol Viviani and Barbara Komoroske, among others. For her faith and spirituality, she thanks her German Lutheran father and Roman Catholic mother. “I grew up with an incredible spirit in my home,” she says. Today, Peggy’s incredible spirit is evident in her own home where she, along with her husband Jim, is blessed with four children and soon-to-be eleven grandchildren. “So what’s next?” I ask her. “What else?” she answers back. Richard Botham’s affiliation with St. Mary’s Hospital spans his entire life, starting with his birth here on New Year’s Day 1926. He graduated from West High School in Madison in 1944 and then served in U.S. Navy from 1944 to 1946. He returned to Madison to attend the University of Wisconsin-Madison for undergraduate and medical school training, graduating in 1952. After his general surgery residency at the Mayo Clinic and a cardio-thoracic residency with the UW-Medical School were completed in 1959, he joined Dean Clinic as its 11th physician and the clinic’s first staff surgeon. With special expertise in vascular, thoracic and general surgery, his skills were renowned. At St. Mary’s in the 1960s, Dr. Botham was instrumental in organizing the cardiovascular surgery program, and he recruited many of the city’s leading heart specialists. Additionally, he served as St. Mary’s chief of staff, the vice-chief of staff, and a member of the Development Council. He also took great delight in teaching residents as a clinical professor of surgery for the UW Medical School. Dr. Botham’s charisma, strength of character, charm and relationships with referring physicians were the building blocks for the Dean & St. Mary’s referral network and Dean’s specialty outreach program. In the early 1960s, when he and a few other Dean physicians decided to build their referral network, Dr. Botham began visiting hospitals outside of Madison, including Sauk City, Dodgeville and Fort Atkinson where Dean physicians had previously received referrals. He attended staff meetings, introduced himself and asked the physicians to send him the patients with problems that the physicians couldn’t treat themselves. He promised that if they would be kind enough to send him their patients, he’d take good care of the patients and would keep the hometown physicians informed about the status of their referred patients. This insightful strategy of “taking care of our referring base” paid major dividends, and Dean’s growth has continued to this day. Even in retirement, he remained active in the medical community, serving as the first physician outreach coordinator for Dean Clinic and co-chairing the $10 million campaign to build the first Madison HospiceCare Center. His contributions to St. Mary’s Hospital, Dean Clinic, HospiceCare and the UW Medical School have left an indelible stamp on Madison’s health care scene that continues well into the 21st century. When St. Mary’s Hospital opened in 1912, the sisters immediately established an endowment program to provide free care to the poor. This commitment to help meet the needs of the community, particularly those with the greatest need and often well beyond the confines of Madison, has characterized St. Mary’s Hospital throughout its history. When St. Mary’s staff identified a problem, they usually found a way to address it. In the 1920s, St. Mary’s physicians offered free check-ups to babies and during the Depression opened a free clinic on site for the poor. Fast forward to 1962, when administrators learned that migrant workers in Endeavor, Wisconsin, were not receiving medical care. Physicians, nurses and other health professionals from St. Mary’s volunteered to staff a clinic to provide free care for the migrant workers. When they learned of the need for someone to provide healthy meals to elderly or disabled persons who might not otherwise have a balanced diet was identified, the St. Mary’s Hospital laboratory and dietary department cooperated in 1970 to create a “mobile meals” program, preparing low-fat, low-sodium, diabetic and regular meals, which were then delivered by volunteers. This was a precursor to the Meals on Wheels program. In 1974 at the request of radio station WISM, St. Mary’s Hospital assisted in the preparation of an ongoing series of one-minute health spots. St. Mary’s started a support group for bereaved parents in 1976 and the “I Can Cope,” support group in 1982 for persons with cancer and persons whose lives have been touched by cancer. During that same year, St. Mary’s Adult Day Health Center opened and today continues to provide daytime care for older but still ambulatory adults who need continuous, individualized medical treatment and rehabilitation. In 1993, 12 St. Mary’s physicians, nurses and OR technicians donated their medical and surgical skills to the Gaspar Garcia Hospital in Rivas Nicaragua. The group spent seven days providing medical evaluations for over 400 children and performing 43 surgeries not easily obtained in Nicaragua. In 1995, Don Sylvester, a clinical engineer at St. Mary’s, was part of a group of Madison medical providers who brought donated medical supplies to Kazakhstan in an effort to help the country re-build its medical services. St. Mary’s donated the ER’s former X-ray machine as well as other equipment, medications and miscellaneous supplies. In 2005, The Helping Hearts program, a venture of the Dean/St. Mary’s Cardiac Center, provided Dane and Rock County schools with automated external defibrillators which allowed trained non-medical individuals to deliver a safe, easy-to-use, potentially life-saving electric current to someone experiencing cardiac arrest. Also in 2005 with the recognition that there was strong need for HIV prevention education in South Africa, St. Mary’s internist Dr. Alexander Kendziorski and his wife Rebecca founded African Youth Outreach, an organization that teaches ways to get treatment and avoid transmission to youth ages 11 to the mid-20s who have lost a parent or family member to AIDS. In 2008, St. Mary’s Hospital “adopted” LincolnElementary School beginning with a drive for school supplies and followed by two days of on-site help with landscaping, painting, library work and classroom activities. The previous examples are but a small sampling of the valiant efforts to help others that were started either as an institutional project or a personal endeavor by committed staff. St. Mary’s has been a compassionate health care community for a century, assuming responsibility to a broadly defined community, ranging from south-central Wisconsin to other parts of the world. In September 1962 St. Mary’s Hospital hosted a series of activities to celebrate its 50th anniversary. One of the highlight events was a Mass and luncheon for the Sisters of St. Mary and their guests. In his “Hello Wisconsin” column on September 11, 1962, Capital Times columnist Miles McMillin shared anecdotes of the celebration. His observations provide a window into the pulse of the event and some of the issues of the day. “…to pay tribute to the Sisters of St. Mary for the job they have done in providing Madison and this area a splendid hospital facility for the past half century….Lawrence Fitzpatrick, managing editor of the State Journal, and I find ourselves sitting at a table with the shiniest business brass in town—Duane Bowman of Bowman Dairy and Don Wagner of Borden; president of Gardners Bakery and Adolph Bolz of Oscar Mayer. With two dairy representatives at the table, the talk inevitably gets around to what cholesterol and fall-out are doing to the milk business. There is the usual wagging of heads over the irony of cigarette and liquor sales going up as unfavorable medical evidence piles up, while the consumption of milk goes on the skids with less credible evidence of danger. The menu for the luncheon included shrimp remoulade, charcoal-broiled filet mignon, golden browned potatoes, minted almond fresh beans, tomato rosettes, twisted-horn rolls, butter cherries jubilee, liqueur burgundy, coffee, tea and milk. In 1974, a professional football player from the Philadelphia Eagles, his team’s owner, a pediatric oncology physician and a local McDonald’s advertising agency helped launch the St. Patrick’s Day Green Milkshake (dubbed Shamrock Shake) promotion. Funds raised by the promotion helped buy an old house near the hospital, which was opened in 1974 as the first Ronald McDonald House. Their dream of providing a comfortable temporary residence for families of children being treated at the hospital had come true. In 2012, construction has begun on the third floor of St. Mary’s to build Wisconsin’s first Ronald McDonald Family Room. This new service will be designed as a place of respite for families whose children will be just steps away in the hospital’s pediatrics and neonatal intensive care units. It will serve families from Madison as well as from other areas of south-central Wisconsin who have the most critical needs “when two miles is too far” to be away from their child. This concept is different from the Ronald McDonald House in Madison, which offers long-term stays for out-of-town families with hospitalized family members. The Family Room will feel more like a home than a hospital, even though it will be housed within the hospital. Among the largest in the country, the Family Room at St. Mary’s will feature four sleep rooms, each with a private bathroom and shower; computers along with free wireless Internet; laundry facilities; a dining area; and a kitchen stocked with food and beverages. Families will be able to retreat to a quiet room for privacy, recharge electronics or ask the volunteer on hand for assistance. All of these amenities – including use of the sleeping rooms – will be provided at no cost to the family. Day 8: St. Mary’s Goes Green—Even in the Snow! In 1990, SSM Health Care system Chair and CEO Sister Mary Jean Ryan required every SSM facility, including St. Mary’s in Madison, to establish a Preservation of the Earth (POE) Committee. She was inspired to act by her congregation’s commitment to nonviolence and a photo she had seen of a polluted harbor. She not only established the POE Committees but also banned the use of Styrofoam cups throughout the system—SSM’s first step in taking better care of the earth. “We have learned that we cannot apply the most advanced medical technology to cure people’s illnesses and then send them home to heal in an unhealthy environment,” Sister Mary Jean said. Using wood from the trees that were in the hospital’s front yard on Brooks Street as architectural elements and furniture. Planning more green space and “pocket parks” for the enjoyment of patients and their visitors. Recycling 63 percent of the materials previously on the 2.7-acre project site. In 2008, St. Mary’s banned the sale and distribution of plastic bottles from the hospital. Three years later, plastic soda and juice bottles were banned, too. Since aluminum and glass are more readily recycled than plastic, these hospital policies would help the environment by keeping plastic out of the landfills. In 2010, St. Mary’s also went green by addressing several snow-related problems. Faced with inconvenient snow piles, unsightly silt, contaminants seeping into storm drains and lakes, and the aftermath of snowfall often requiring dump trucks to transfer snow to another location, St. Mary’s Plant Services began melting snow on-site through a new process that provided both aesthetic and environmental benefits. Loaded into a specialized bin brought to the site, snow is sprayed with hot water to melt. Oil and other non-soluble products are extracted, and silt particles are filtered out before the clean, melted snow is diverted to a storm drain. As a result, the dirty snowmelt doesn’t reach the lakes. The process also eliminates the need for trucking, providing further environmental benefits. It was the worst of times. Back in the late 1980s, the Douglas family had nearly lost their little boy to serious illness. They credit the competent and loving care of Kysa Olson for helping to save his life. So grateful were they that they named their third child after this St. Mary’s nurse. Fast forward more than two decades. Baby Kysa had grown up to be a nurse herself. At St. Mary’s no less. During her first day on the floor in Family Care Suites, she noticed her name on a duty board and asked what was expected of her. When she learned that another nurse named Kysa works here, she told her colleagues how she got her name. Mouths dropped. Because Kysa Olson has worked at St. Mary’s since 1975, she simply had to be the same Kysa after whom the new nurse is named. A reunion ensued and 22-year-old photos of the two were dug out of memory boxes. The two Kysas are joined again by virtue of their professions. Kysa Olson now works in Care Management and is assigned to Family Care Suites, where Kysa (Douglas) Bigler works caring for newborns … not unlike where the story began. Sign up to receive our 100 Stories in 100 Days via email!